In anticipation of all the logs I would be getting from the powerline right-of-way expansion on our property, I made a few changes to my firewood processing system. I built a new sawbuck out of sturdy 2x4s, lag bolted and screwed together so I’d be able to repair it when the inevitable creaks and groans set in. I also bought a new log splitter. Except for the first few years when we were living out here, I’ve always split the firewood by hand with mauls and wedges. I decided that was a luxury I couldn’t afford this year. My new setup involves positioning the sawbuck, splitter, and Scout pickup as close to the logs as possible. I stack the smaller ones on the sawbuck until it is full, and then I saw them up and toss them into the Scout. The larger logs are cut in place on the log pile. After I cut them to firewood length, I toss them into a pile by the log splitter. When I have enough piled up, I contact Alice, the operator, and with her on the lever and me hoisting the firewood chunks up, we split and toss into the Scout. This new system is working very well. The Scout seems to fill up with firewood almost like magic. I then back it up to the woodpile, stack up what I’ve hauled, and go back for another load. The goal is to hit the firewood project hard while the weather is cooperating, and hopefully get as much done as I can. Once this year’s firewood is done, I plant to implement phase two of the log project. I hope to continue making firewood both for the house and for the maple syrup operation, and custom build some pallets on which to stack this wood. I’ll use chunks of an old greenhouse cover to make a tarp for the top of these pallets. 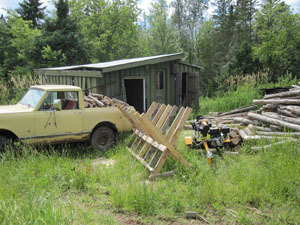 Then I’ll move these pallets full of firewood with the forks on the dozer someplace where it is out of the way. That is the plan. This entry was posted on Wednesday, July 24th, 2013 at 9:06 pm and is filed under Uncategorized. You can follow any responses to this entry through the RSS 2.0 feed. You can leave a response, or trackback from your own site. I’m glad to see those logs are going to be out to good use. Good to see the Scout still running too.